Not much needs to be done to this tomato, slice it, wedge it or dice it are serve it raw in salads and pair it with burrata or fresh mozzarella and basil for a traditional Italian Caprese salad or combine it with other heirloom tomatoes for a beautiful and flavorful summer tomato salad or side dish, a great green tomato for brightening up salads and other tomato dishes. 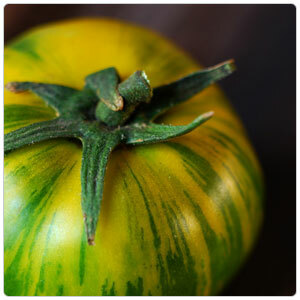 Generally, all heirloom tomatoes pair well with grilled or wood roasted red meats and flakey white fish and seafood. They also make great additions to pizzas, pastas, sauces, soups, and sandwiches.